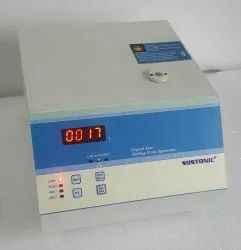 Providing you the best range of digital auto melting point apparatus s-972 and microprocessor melting point apparatus s-975 with effective & timely delivery. 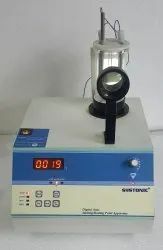 Digital Auto Melting Point Apparatus Up to 300C, Suitable for Melting / Boiling Point, Readability in C, Resolution 1C, Programmable, Visual provision by Optical Magnifier, Automatic Ramp Rate Proceeding, Auto Gradient Rate of Heating Control, Sample Capacity 3 samples. The unit consists of a built in magnetic stirrer, glare free background illuminator and cylindrical silicon oil bath. The silicon oil bath consists of a plain cylindrical container of corning glass having capacity of about 200 ml. It is furnished with a Teflon cover fitted with special type of oil immersion heater, having three small holes for holding the capillaries, one big hole for thermometer and another big hole for boiling point tube / Temp. Sensors for calibration purposes. A variable speed stirrer is fitted in it. The apparatus can be used for determination of boiling points, Temp. effect on viscosity /flow points and molecular weights by Rast's method with suitable accessories. - Melting View Magnifying display of melting operation with the help of adjustable magnifying glass, Melting point reading hold on by activating the "HOLD" key & reading is protected from power failure till "RESET" is not activated.